A 5 card draw joker poker game. £1 stake £70 Jackpot. Play draw poker to win poker hands. 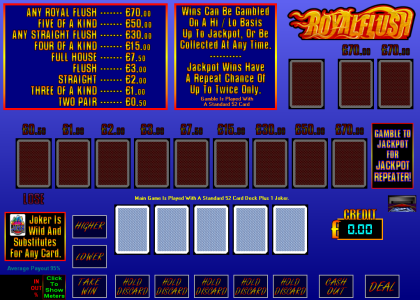 Each winning hand you may collect or try to gamble up to the Jackpot repeater! Each gamble is high or low. This game has hide meters option and keyboard shortcuts. Once payment has been made please request your game code via email to activate your game fully. Game updates and codes are sent out as soon as possible.